Home » FAQ » How do I measure my area to tile? We are more than happy to punch your rooms measurements into our calculator for you! To know how much tile you should buy, we just need the basic measurements first. The typical method is to measure a room in “squares” & perhaps draw a diagram with labels & break up the room into multiple squares, as shown on this wikihow article (click here). Need more details on ideas to answer the question: “how do I measure my area to tile”? Read on. We want to get you & your floors “covered” with tile. 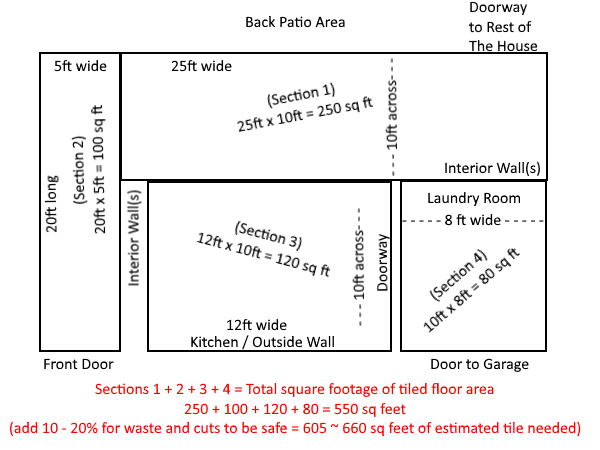 How do I measure the floor area I want to lay tile on? You’ll want to measure the floors area into square or rectangular sections. Most rooms are not “4 sided” so or example: The entrance foyer area might be 5 feet wide & 20 long, which connects to a living room that you want the couch & television in, with another section that leads to other rooms of the house like a kitchen, hallway or laundry/utility room. It’s generally a good idea to stick with a tile color scheme & pattern. See the diagram for an example of how to break up your room into square feet. You simply add up each section so you know how much tile you need. Again, we can help you with this math. Geometry is our JAM! What about measuring my rooms for a custom tile design? Having too many different colors & tile cuts within an area without doorways to separate the rooms can take away from the overall beauty of your design. There are a few “tile design tricks” to set the rooms apart while using the same primary tile. Tile medallions are a great finishing touch for a front porch or living room design. A tile kitchen backsplash or sparsely used offset kitchen wall tile can give you the “fancy” look you see in expensive hotels & waterfront properties. (We Fancy, You Fancy!) K&S Wholesale Tile is more than happy to help you make a great tile decision if you have some ideas you need to bounce off of our experienced staff & management. You’ve done this before. We would love to help you save time as well as money. You’re going to feel good about your decision to choose K&S Wholesale Tile.